MEXICO CITY (AP) -- Seven men have been killed in a shooting attack at a bar in Mexico’s Caribbean coast resort city of Playa del Carmen, authorities said Monday. State and local police said the attack occurred late Sunday at the “Las Virginias” bar in a low-income section relatively far from the beachside tourist zone. Six men were found shot to death in the bar, and another died at a local hospital. Playa del Carmen is located on the coast facing the island of Cozumel, Mexico’s leading cruise ship destination. Once a quiet fishing and ferry town, Playa del Carmen has grown exponentially in the last two decades, with lower-income neighborhoods springing up on the inland side of the coastal highway. 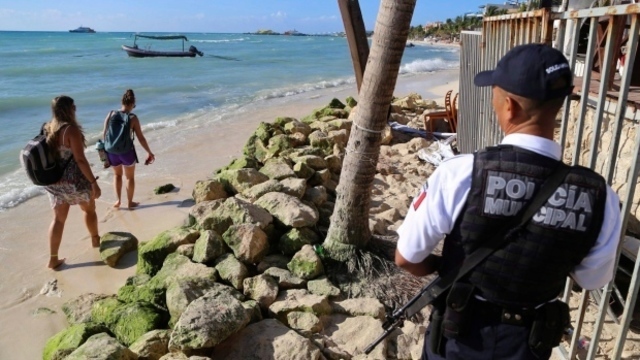 The Caribbean coast — especially Cancun and the area south known as the “Riviera Maya” — had long been largely spared the drug violence affecting other areas, but that no longer appears to be the case. Local sources report that the feared Jalisco cartel has moved into the region, disputing control with local gangs.